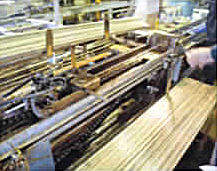 An existing steam boiler retrofitted with a heat pump-equipped water supply that preheats water reduces boiler load during the degreasing wash used in manufacturing seamless pipes. 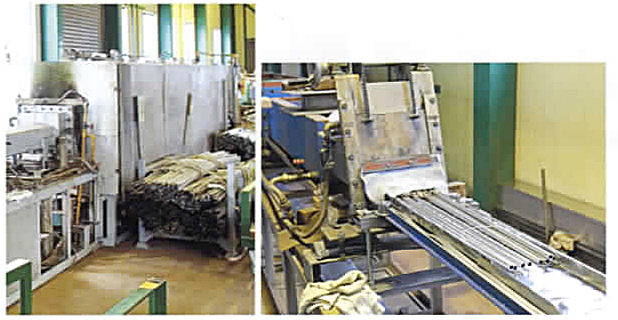 Anti-oxidation heat treatments use electric furnaces with precise temperature control like this one to efficiently create a highly uniform finish on pipes entering (left) and exiting (right). 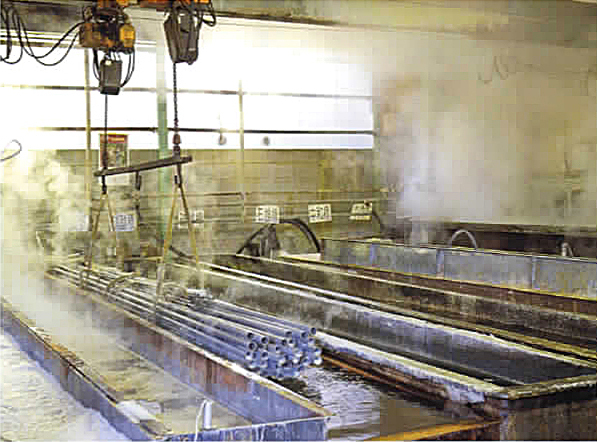 As a precision steel tubing manufacturer, Kyoto Seikan Co., Ltd. has been meeting customer needs with cold-drawing manufacturing techniques and other advanced technologies since 1967. In heat treatment processes, we use electric furnaces with precise temperature control to help us achieve the high quality and micron-level precision required in fields like rocketry, aeronautics, and the automotive industry. To reduce the operation of energy-consuming steam boilers used in post-draw pipe degreasing processes, we’ve retrofitted existing LPG-fired steam boilers with heat pump-equipped water supplies that recycle waste heat to preheat 22°C well water to 60°C. This hybrid system assists the boiler in bringing the water to the 100°C boiling point, reducing the overall operational load and curbing both running costs and CO2 emissions.